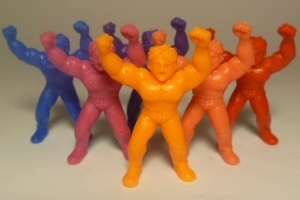 This week people I want to talk a little bit about M.U.S.C.L.E. 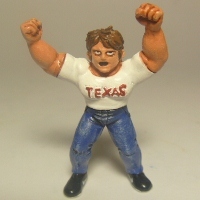 figure #208, also known as Dickieman or Texas! This is one sweet figure and in my opinion, quite underrated. Maybe it’s because there is no Class A figure that he is overlooked, maybe it’s because he has no real backstory in the Kinnikuman manga – apart from him being a student of Terryman and looking similar to him. I like the fact that he has no real connection to other figures in the M.U.S.C.L.E. line and that he stands tall and proud over other figures. He certainly is not undersized! I got a Flesh Dickieman then I went Dark Blue and then Purple. I couldn’t handle the pain anymore and found Salmon, Red, and lastly Orange. I’m not sure what was wrong with me but I had an Orange one when I was a child. Lastly, I will mention the custom job I got from my surgeon Plastic Playhouse – hands down the best customs in the hobby! This entry was posted on Monday, August 26th, 2013 and is filed under UofM News. You can follow any responses to this entry through RSS 2.0. You can skip to the end and leave a response. Pinging is currently not allowed. As a kid, I always called him “Normalityman,” and made him the hero even though I thought he was boring, because heroes are always the boring ones. As a kid, I loved this figure – which is wildly uncool to say as an adult collector. Frankly, I still really like him. The figure has such an odd, but very playable pose. He is the only one I can remember from childhood which could really look like he was body slamming someone. And jumping at them to tackle them. And celebrating a win. Hell, he could even look like he was flying. 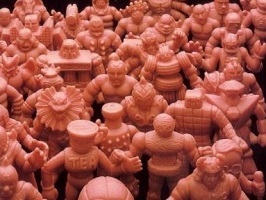 I am trying to find a M.U.S.C.L.E. man that my son had as a child. Maybe someone on here can help with a name and possibly a source to buy one. It is orange with spikes and had a star for one eye. Any help would be appreciated! Thank you in advance. Hi Debra – I’ve emailed you some information that should be helpful.